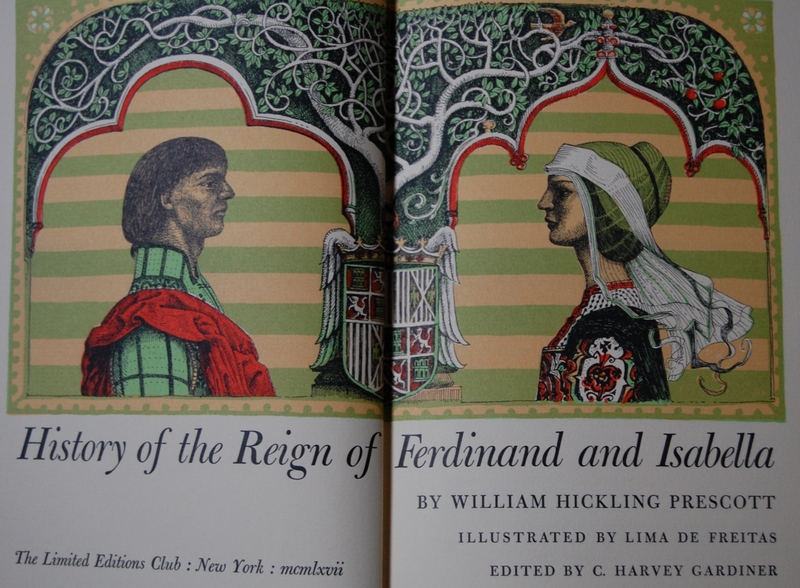 Front Binding – My final LEC post from my latest set of purchases is the 1967 issuing of Ferdinand and Isabella, done by the thorough historian William Hickling Prescott. 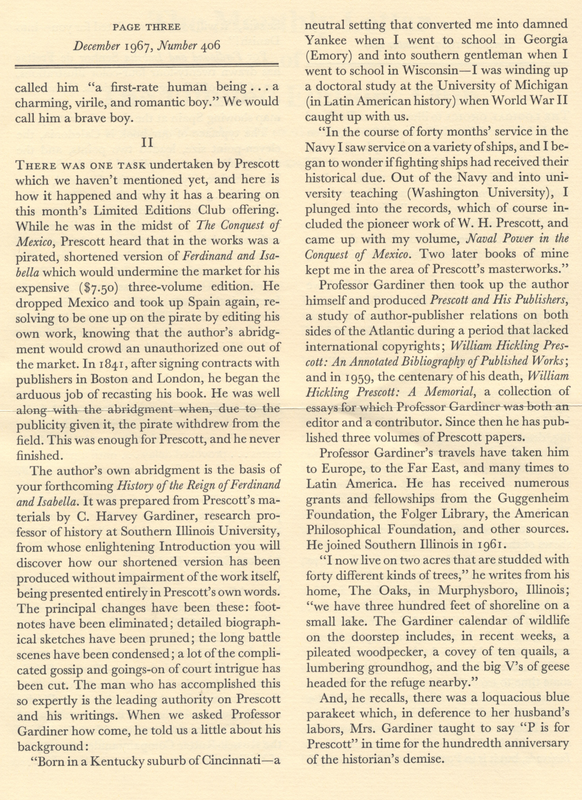 Coming from a fairly well-off family, Prescott went to Harvard and did well enough to earn honors, although his early career did not show a ton of promise. Unfortunately, Prescott was wounded in a food fight one day on campus; a hardened piece of bread crust struck him in the eye, and his vision slowly but surely waded into complete blindness as he grew older. However, he decided to not let that affect him from his burgeoning passion for history, and took advantage of the eyesight he currently had to read voraciously the many works that would eventually be cited in his own histories. His memory was eidetic, and he was able to catalog huge stashes of information into his brain — a feat that allowed him to write (or dictate, depending on his flaky vision) the histories he now is renowned for. Pretty amazing. 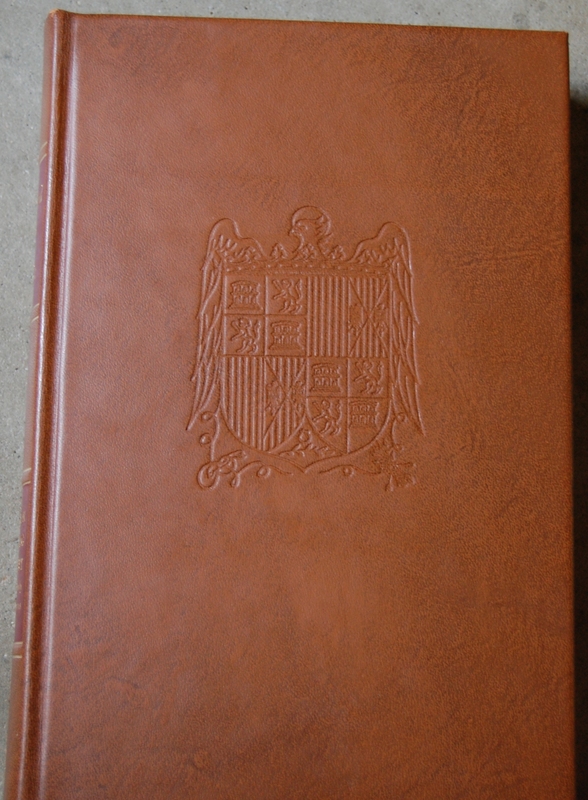 Prescott had two LEC’s released: The History of the Conquest of Peru in 1957, with Everett Gee Jackson providing the artistic talent, and this one, issued in 1967. 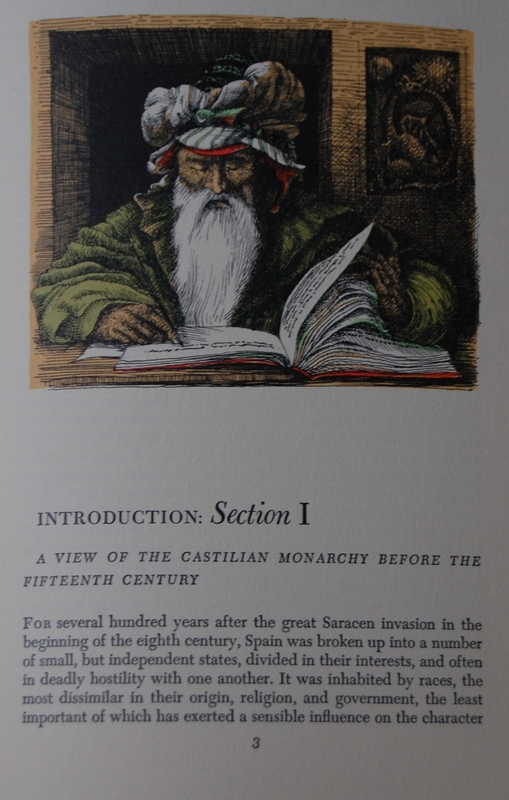 The Heritage Press issued his final major work, The History and Conquest of Mexico, recycling Miguel Covarrubias’ artwork from the LEC The Discovery and Conquest of Mexico by Bernal Diaz, in 1950. Lima de Freitas came into the George Macy Company fold rather late, but left his mark in four LEC volumes in the 1960’s. He has a distinct, vibrant style that I quite like, particularly when the work is colored in. He began with the 1961 LEC Nostromo by Joseph Conrad, and followed that up with the LEC issuing of Christopher Columbus’ Journals in 1963. 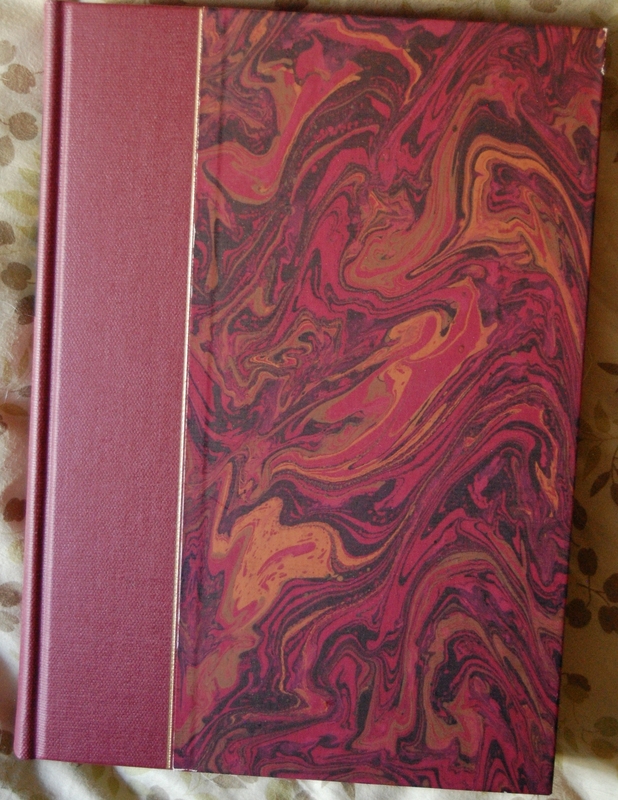 This book followed in 1967, and his last commission was Washington Irving’s The Alhambra in 1969. I’ve seen or own all but the last, and I can say without a doubt that de Freitas was a highlight in the post George period of the Macy Company’s artist stable. 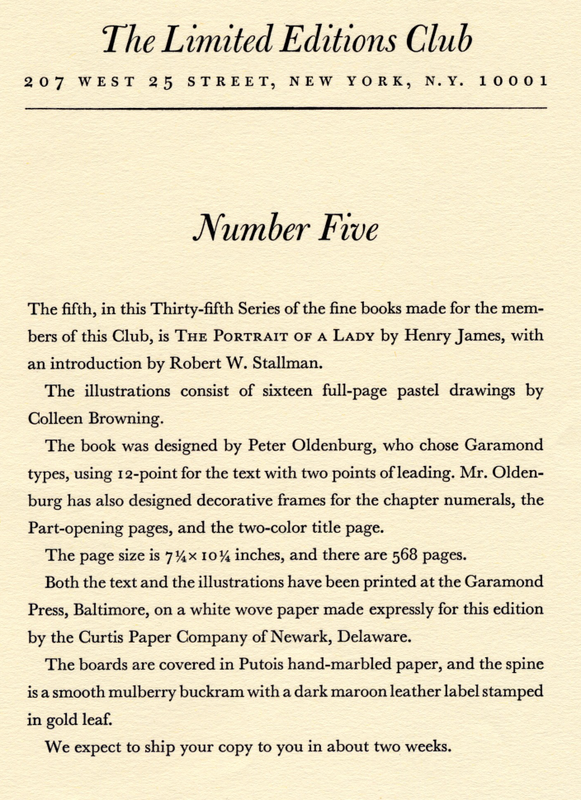 Design Notes – The Garamond Press of Baltimore was responsible for the creation of this book. 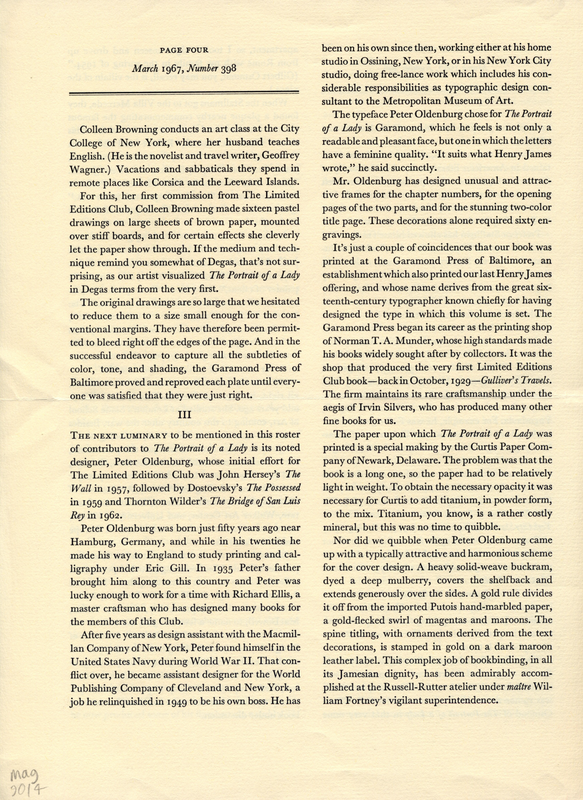 John Stone (the sole employee of the Yankee Typesetters) served as the typographical designer, and he picked Caledonia as his font. 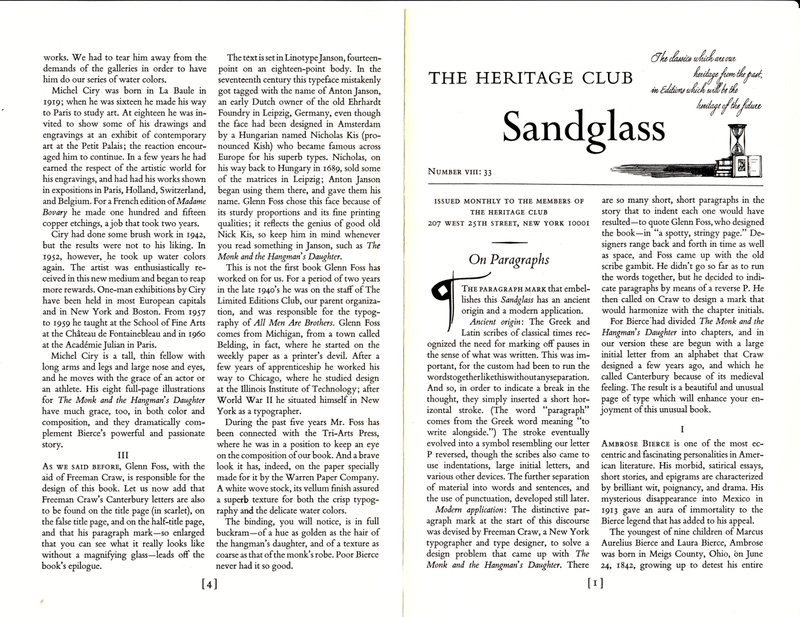 After setting up the pages, the Garamond Press set to printing the text, supervised by Irvin Silvers. 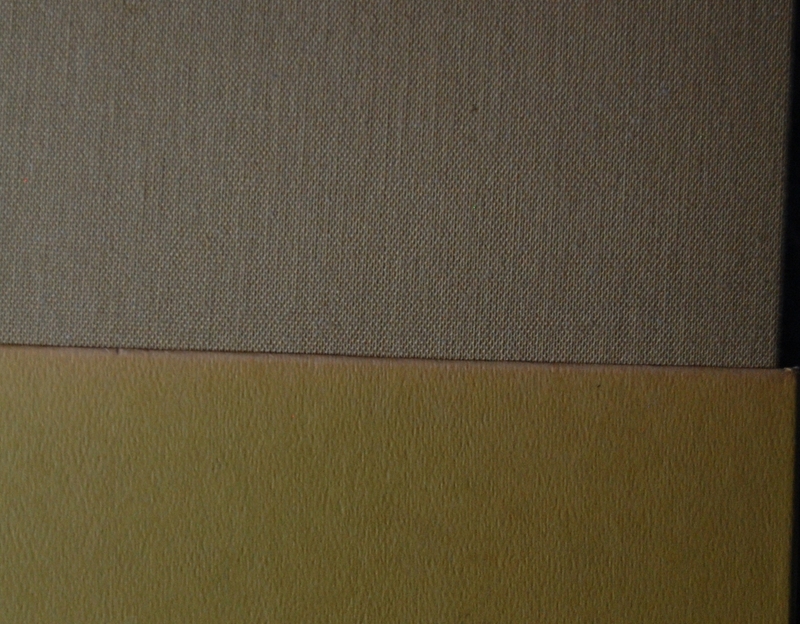 The paper is a special ivory-colored type from the Curtis Paper Company. 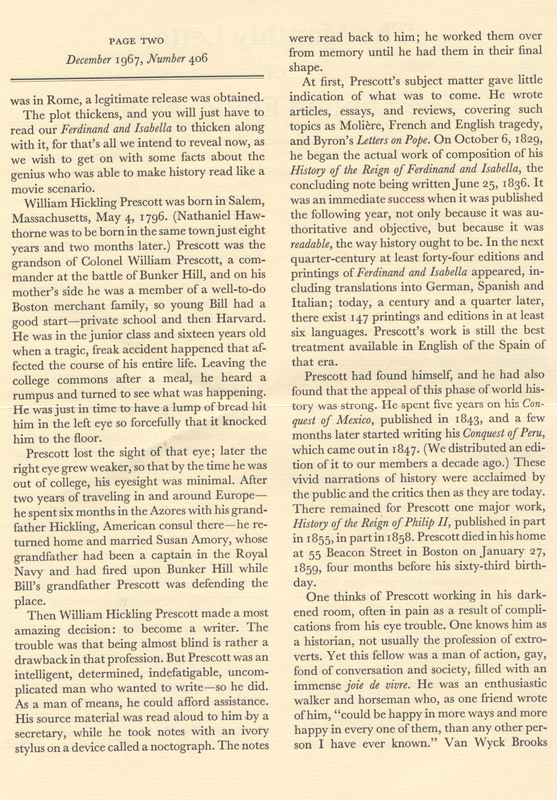 Russell-Rutter served as the bindery, and William “Frank” Fortney covered Prescott and de Freitas’ pages with a tan cowhide. The Catholic coat-of-arms of the two royal figures in question was embossed into the front, and a red skiver label was prepared with gold leaf to serve as the spine. 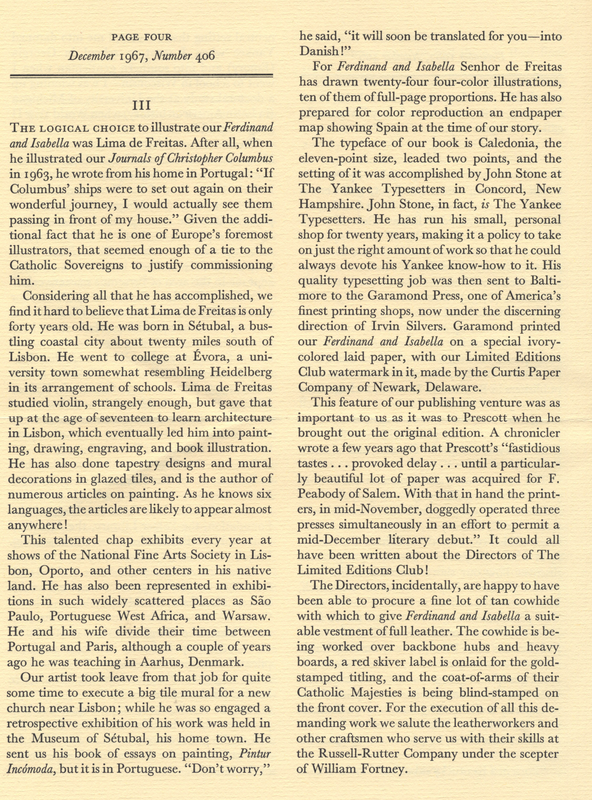 The letter is silent about how de Freitas’ art was reproduced, so I’ll have to refrain from those particulars for now. Title Page – C. Harvey Gardiner looked over Prescott’s work and made slight emendations (of which square brackets are used to distinguish Gardiner’s edits from Prescott’s), structural (long-winded sentences have been cut into shorter sentences, and some internal punctuation has been removed) and abridgments (Gardiner toned down some of Prescott’s indulgences, and modernized the work to trim back some of the less historical bits) to the work. Gardiner argues that the work is still Prescott’s, but with some tweaks to make him more accessible to the (then) modern reader. He explains all this in an editorial preface to the work. 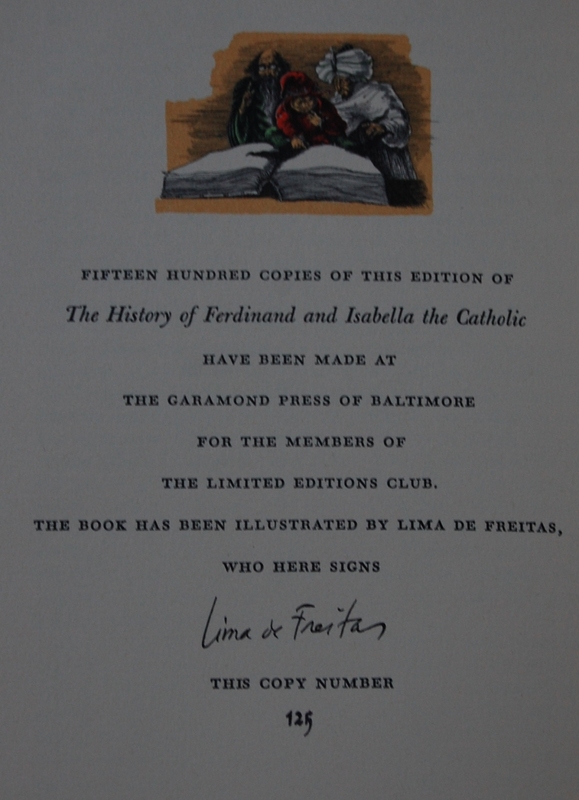 Colophon – Lima de Freitas signs the book, and this happens to be #125. I think this is the earliest number I’ve picked up so far! 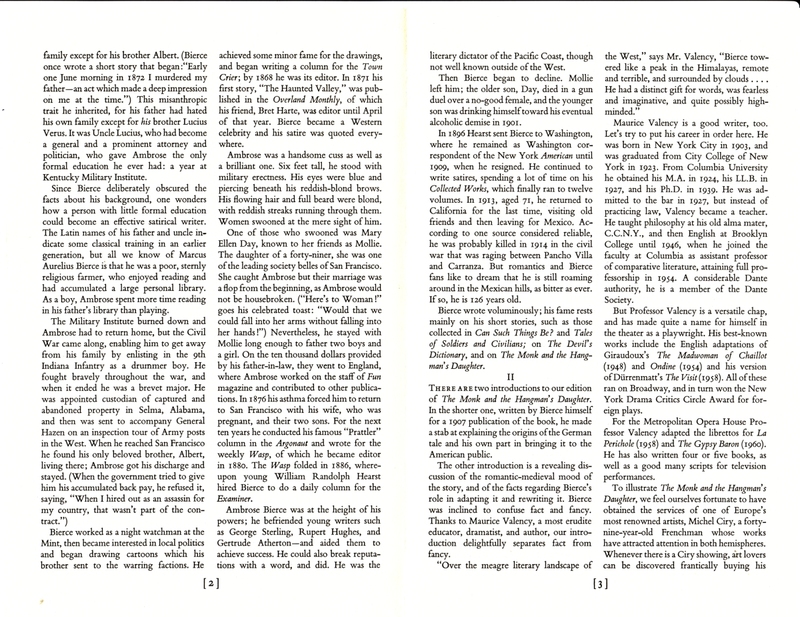 Page 3 – Twenty-four illustrations, plus some maps on the endpapers, decorate the text. Most are of this size.. 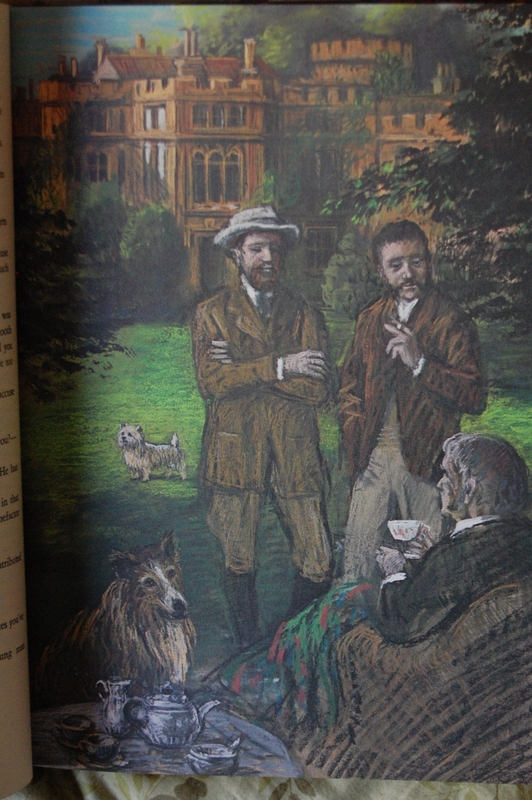 Page 45 – But there are ten full-page illustrations like these. I love the colors. 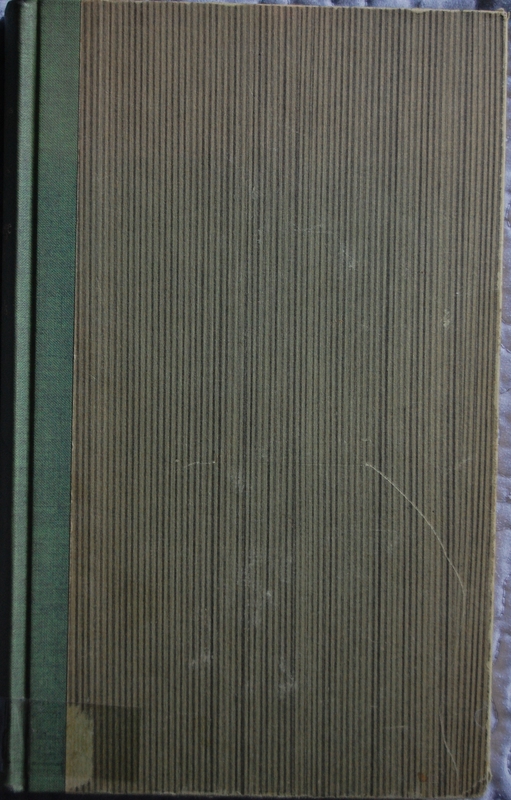 Personal Notes – The LEC came into my hands via Bookbuyers in Monterey. On occasion I’ve found a LEC there, and both times I’ve been able to pick it up for store credit. This did not have the letter, unfortunately, but I snag LEC’s in great condition where I can find them. This was marked at $30, but there was a slip from an earlier owner that informed me that they paid $97.50 for this book! Go bargains! I had the Heritage edition of this prior to owning this one, and I got that from my Oakhurst library acquisition of 50 titles. I still have it, but it’s buried in storage right now. When I fish it out, I’ll update this post to do a proper comparison. 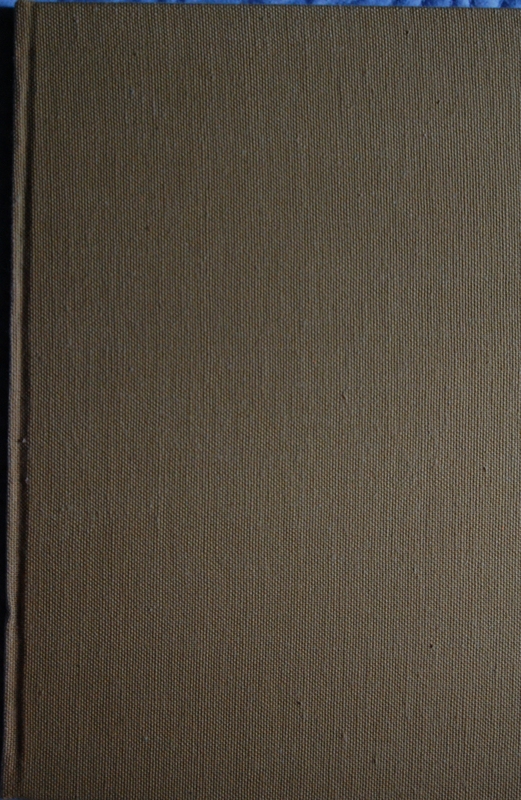 Front Binding – Ambrose Bierce makes his blog debut today, with the second of three publications of his issued by the George Macy Company and the Cardevon Press. The first was 1942’s Tales of Soldiers and Civilians, which Paul Landacre performed artistic duties. The latter was 1972’s The Devil’s Dictionary, starring Fritz Kredel’s talents. This one is a curious book, as it was not Bierce’s in the first place. The story told here was originally put to the page by German author Richard Voss as Der Mönch von Berchtesgaden. Its English translator, Gustav Adolf Danziger, contracted Bierce to assist him in editing the piece, which he did as a favor for Danziger (Bierce was an ardent supporter of the man’s ambitions; Danziger later wrote an essay about Bierce in the 1920’s). 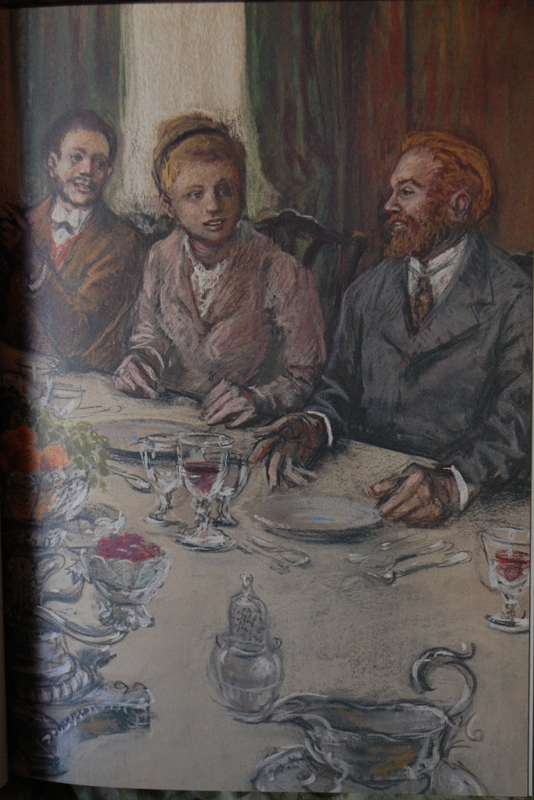 And so, here we are with Bierce’s adaptation of Danziger’s translation of Voss’ story. Whew. Bierce himself had a rather crazy life; I suggest a visit to his Wikipedia page. His curious disappearance in Mexico is the stuff of literary legend. 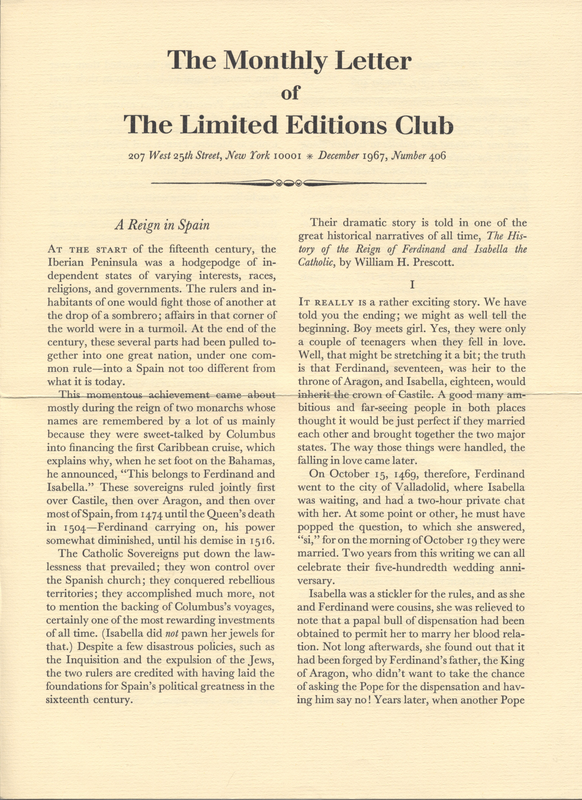 While perusing that page, I noticed a quote from Reader’s Club judge Clinton Fadiman, who was apparently not too big on him: “Bierce was never a great writer. He has painful faults of vulgarity and cheapness of imagination. But… his style, for one thing, will preserve him; and the purity of his misanthropy, too, will help to keep him alive.” Bierce still holds some clout in the literary world, so I suppose Fadiman’s backhanded compliment holds true. Moving on, Michel Ciry made his sole contribution to the LEC canon with this book. His style has a children’s book feel to me, which may or may not be apropos for the tale within, but I haven’t read it yet. The Sandglass goes into more detail. 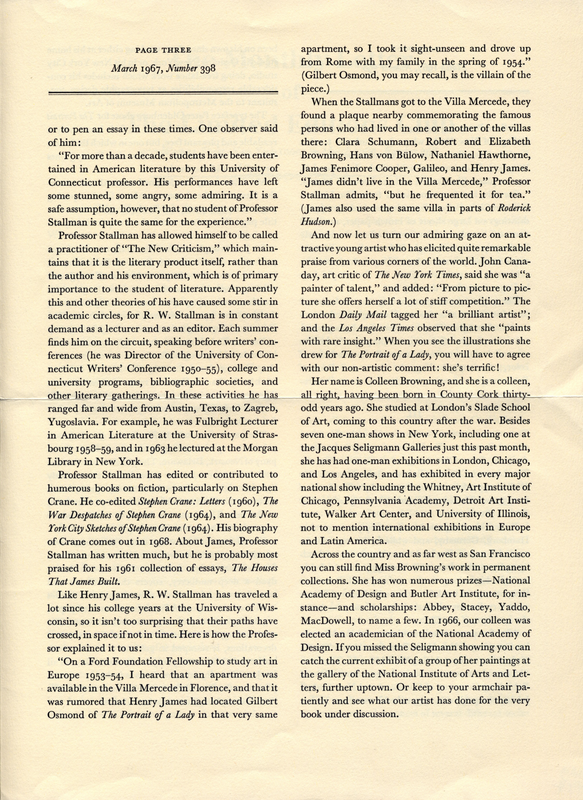 Title Page – Maurice Valency provides some background on this book’s history via Introduction. I do like Ciry’s work, but at times I feel it’s a little plain and, as I mentioned before, possibly too childish. Maybe it’s the bold colors? Page 28 – Ciry uses color splendidly, I must say…even if it does convey a more children’s book approach. It’s hard for me to pinpoint why I feel that way, but I do. Personal Notes – A trip to Bookhaven netted this book; I was dawdling between my book choices on this particular visit, and my wife suggested this one as the concluding volume. 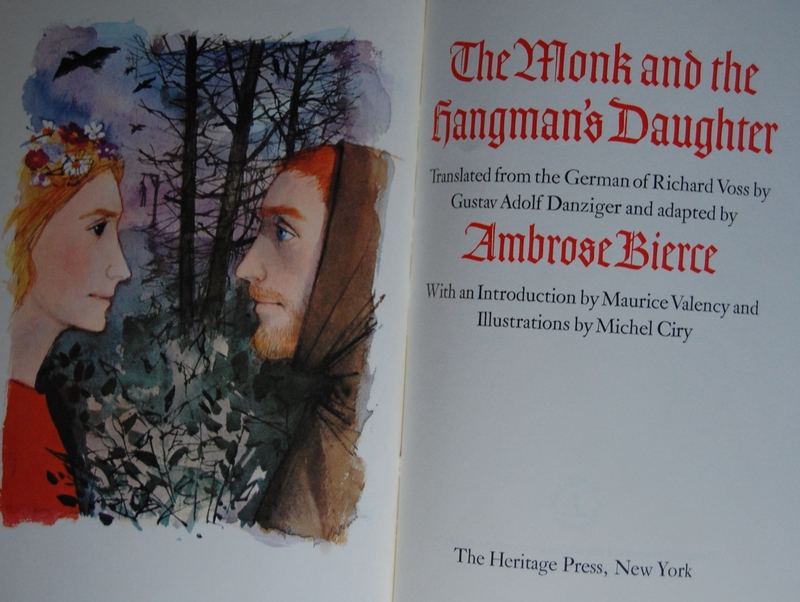 I knew of Bierce and his rather intriguing history, so I figured why not? 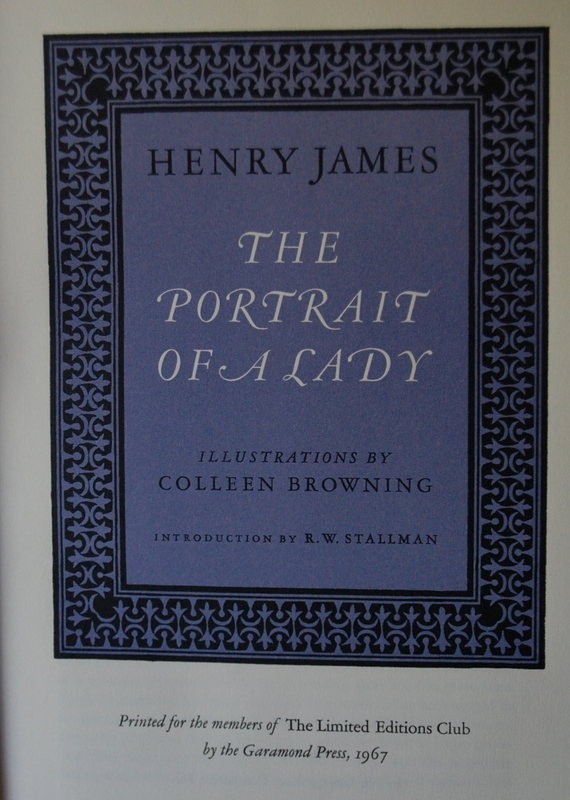 James was apparently not too high on George Macy’s list of authors; in his lifetime, he only printed The Turn of the Screw in 1949, often considered among the Devotees as the finest of the bunch. Mariette Lydis did a spectacular job with the art on that one; eventually I hope to be able to share it with you. 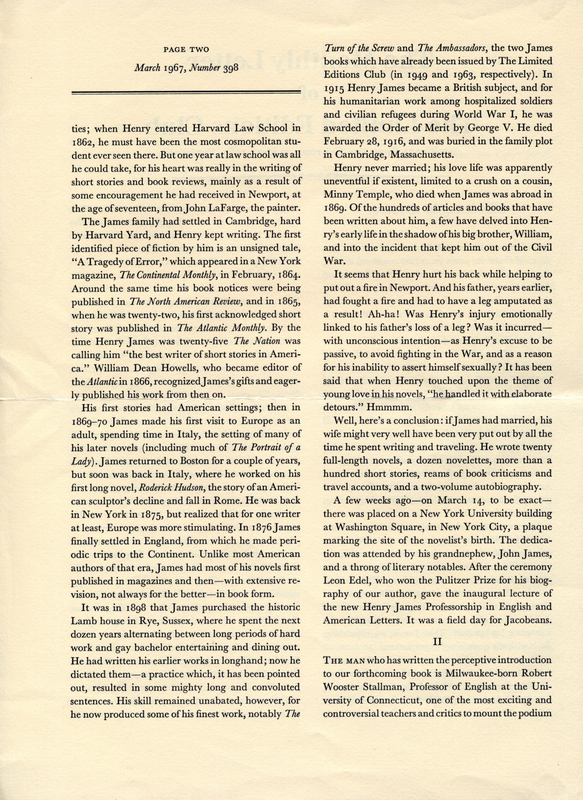 After George Macy passed away, James sort of exploded in printing popularity. 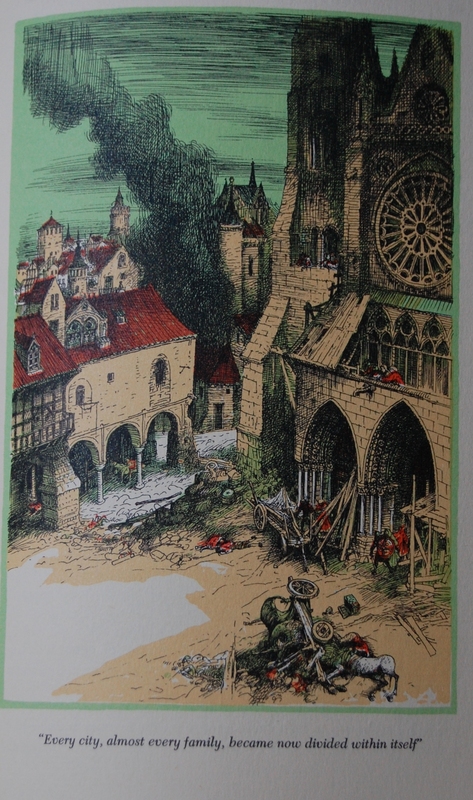 The Ambassadors came next in 1963, featuring Leslie Saalburg’s artwork. 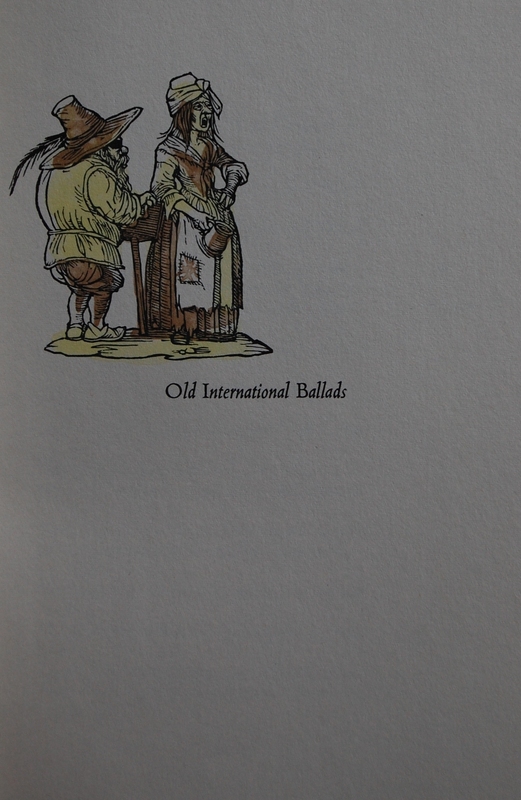 This was followed by this particular volume in 1967. 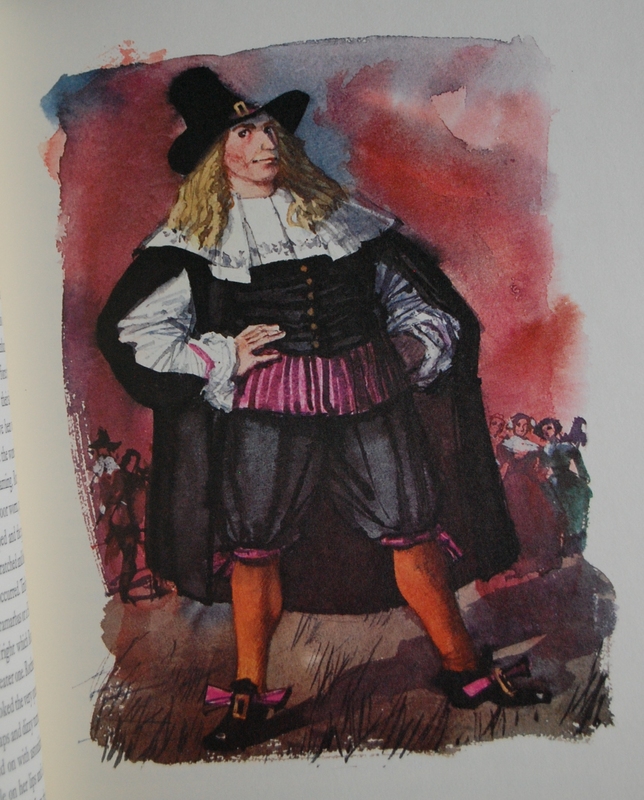 Daisy Miller proceeded in 1969, starring Gustave Nebel as artist. Last was Washington Square in 1971 with Lawrence Beall Smith’s illustrations. That’s all of the LEC’s, and I believe all of them have Heritage editions. However! The Easton Press oddly resurrected the Heritage Press in the 1990’s to issue two more works of James with the artistic merits of an Alan Phillips; The Europeans and The Bostonians. These can also be found as Easton editions, so I’m not sure why exactly MBI Inc. decided to dust off the Heritage Press label for them. Colleen Browning has a lengthy bio in the Monthly Letter, but all that verbiage was spent on this sole contribution to the Macy publishing houses. 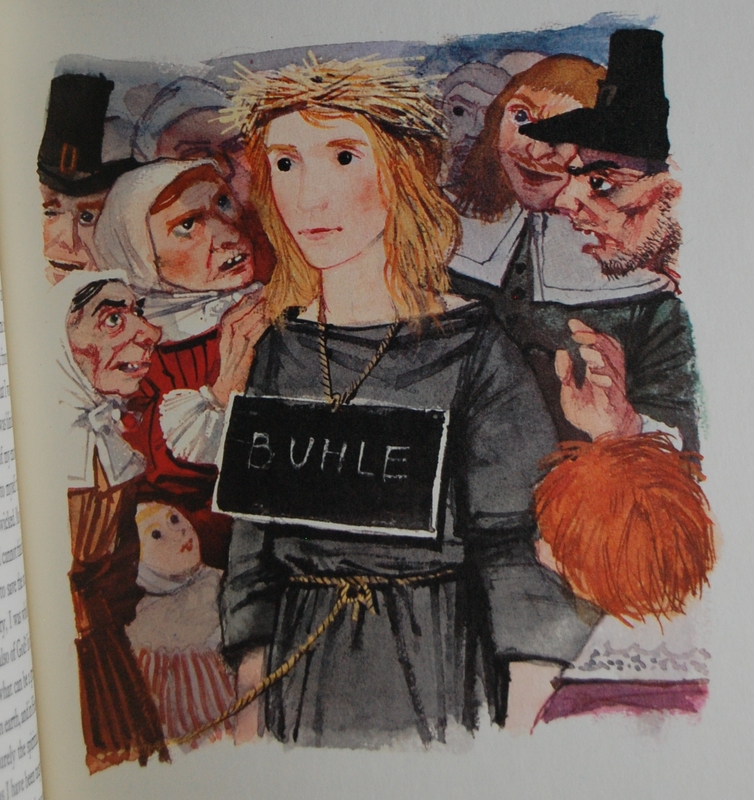 Her pastels work fairly well in the context of a James novel, but I will admit that this particular book is not my favorite set of illustrations. Nice, but not awe-inspiring. 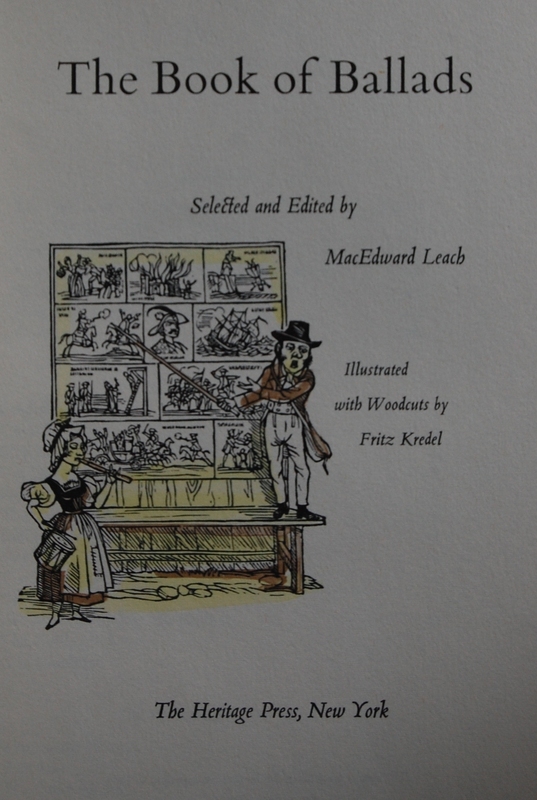 Title Page – The book continues the title page’s “blue decoration box” motif for its chapter openers. Robert W. Stallman issues the introduction. 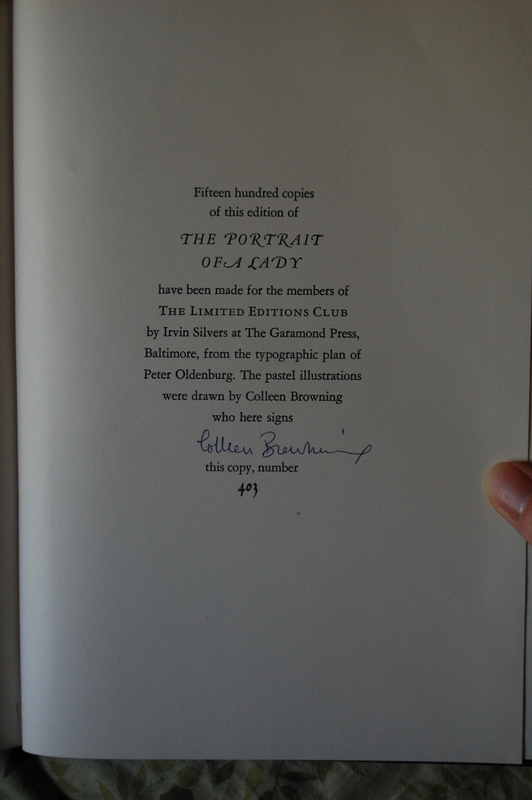 Signature Page – Another #403 for my collection! Browning provides her signature. 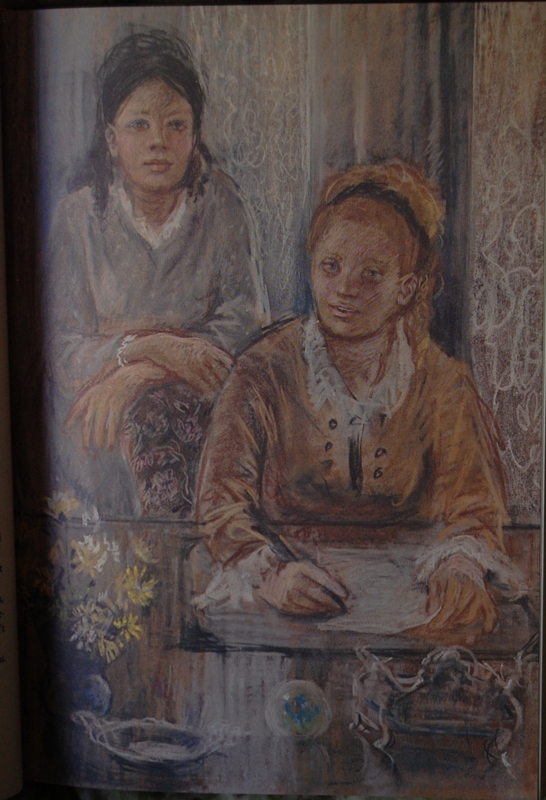 Page 8 – Browning’s pastels are, in my opinion, a good fit with the Victorian era James utilizes. 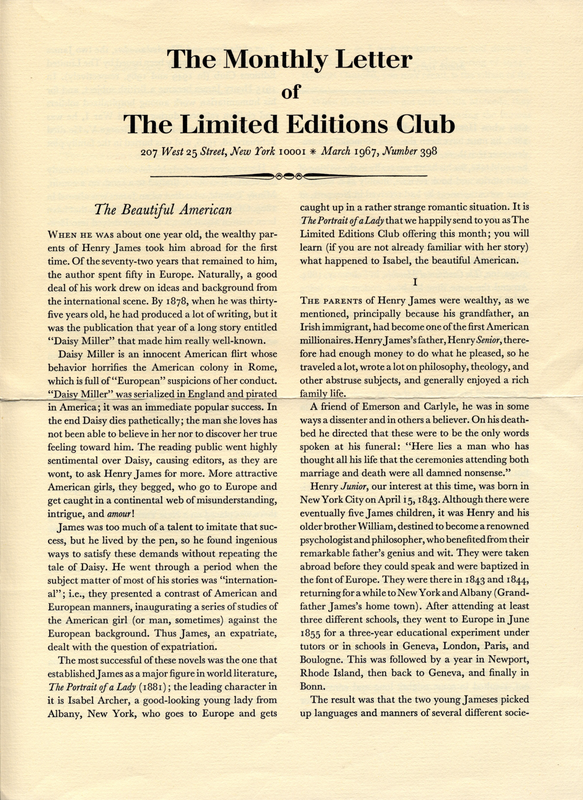 Personal Notes – I picked this up at Old Capitol Books in Monterey, CA last time I visited. It was around $40 or so, but I traded in some stuff to make it technically a freebie. I am pleased to report that, following the change-over from Bookhaven, Old Capitol is doing swimmingly. I wish them the best, and will continue to shop there on my subsequent visits to Monterey. You are currently browsing entries tagged with 1967 at The George Macy Imagery.